If you're headed to the Texas Hill Country, then why not rent one of these vacation rentals in Spicewood. 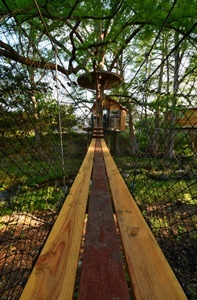 These treehouse and vacation house rentals in Spicewood are perfect for a vacation or weekend getaway where you can enjoy a zipline canopy tour and explore the Texas Hill Country and all that it has to offer from golf to wineries. At Cypress Valley you can fly through the tree canopy, spend the night in magical treehouses, and even get married in these ancient cypress trees. Cypress Valley offers the rare combination of childhood magic and adult comforts. 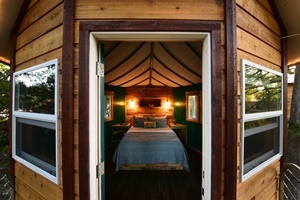 "During the day, you hear squeals of joy as people zip through the creek ravine and at night treehouse guests get to experience a one of a kind overnight stay -- listening to the magic of owls, watching the flicker of fire flies, and dropping into relaxation you can't find in the city." 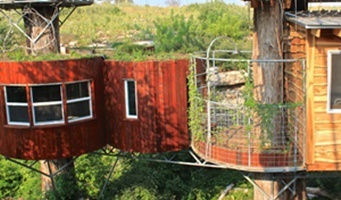 Each Cypress Valley treehouse offers a unique opportunity to stay overnight above the creek ravine nestled in a tree. One treehouse, , includes a beautiful ancient cypress tree growing through the middle of the tree house and a rock grotto waterfall filling soaking tub in the private bathhouse. A romantic escape usually only had in remote and exotic locations. 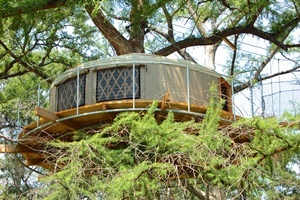 Another treehouse at Cypress Valley, , captures the essence of a 'Swiss Family' escape with two bedrooms, a kitchen, and look out perches to climb into and read a book or watch the starry sky. Everyone who visits Cypress Valley gets to drop the world for a while and play. Onsite guests can enjoy cooling off in the vortex fed pool; and depending on rainfall, there is also a private lake for swimming with a zip line from which swimmers can drop into the lake. Many visitors picnic under shade trees at tables surrounding the lake. "People come to celebrate honeymoons, anniversaries, girls' weekends, and birthdays,and leave with memories they will keep for a lifetime!"